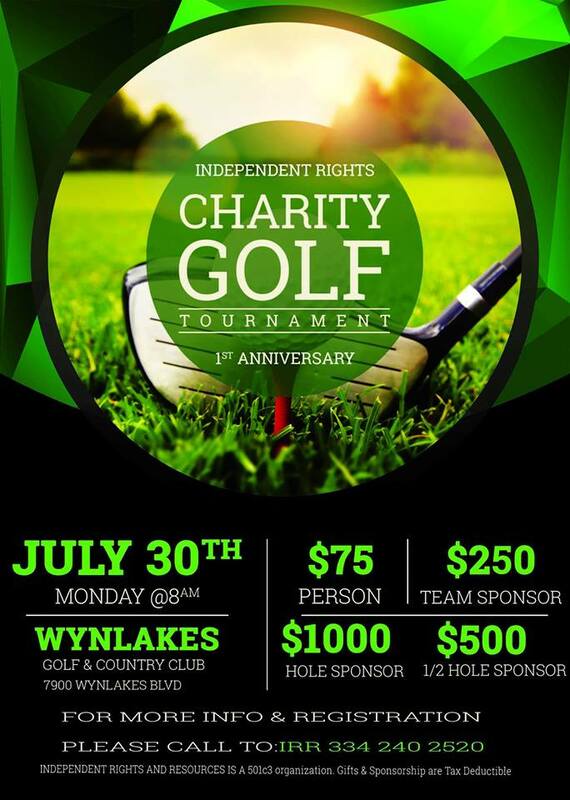 The Independent Rights and Resources (formally The Montgomery Center for Independent Living) Annual Charity Golf Tournament Fundraiser will be held on July 30, 2018 from 8 a.m. – 1 p.m. at Wynlakes Golf & Country Club. All proceeds will directly benefit the transportation program and the home modification program. To ensure the success of this very important fundraiser, we are seeking SPONSORS, PLAYERS, DONATIONS and CONTRIBUTIONS of items for auctioning and door prizes. Generous donations of your time and money are the key to our success and make it possible for The Independent Rights and Resources to assist one of the most disadvantaged groups in its service area, people with disabilities. • Provide services to individuals with disabilities in Autauga, Elmore and Montgomery counties. • Assist each person we serve in maintaining a maximum level of personal independence. • Foster and promote the community integration of individuals with disabilities. Our service attempts to create a fully accessible area where individuals with disabilities are fully participating members of its own workforce, educational institutions, cultural and recreational activities, political arenas and social spheres. • Transportation to Dr. Appointments, meetings, work, etc.